Military Dad and 4 year old son honored during Blue Jackets game. So I happen to be passing through Columbus on my way home from a long day and realize the Jackets are playing the overrated Blues. Couple emails later, I have my ticket. I actually enjoy going alone even though people find it odd. Game was great but the highlight of my day, night, maybe life was meeting Sergeant Sean and his 4 year old boy, who “wishes he was 6” according to Dad. Sgt. Sean was honored at the game and if I heard correctly, he had over 20 medical procedures (i think surgeries) only to return to active duty. To protect us all. I was shaking and so honored that he would pose for my goofy blog (which I was clear to him it was). Seeing the “special forces” patch on his sleeve. Seeing his child. Like many people are when they meet celebrities, which I find silly, I was really nervous. I’d rather meet this guy any day. That’s why my photo is so bad!!. I was shaking, and for the rare time in my life, really felt like I had nothing to say. Other than thanks. What else could I say? I cannot even comprehend a life so rich, so brave and honorable in ways I’ll never know. Here I am leaving the game early after a LONG day so I can get home to see my family. This man probably leaves his family for years at a time to go duck bombs and bullets. Never forget what, and who, really matter! It ain’t LeBron James. Thank you my friend. And “maybe” said dad, Stone will be a hockey player. I know it’s cliche but really think about what these men and women do for each and every one of you. Tomorrow, I meet another superhero (maybe) Puckdaddy. LOL Daddy or Special forces guy? 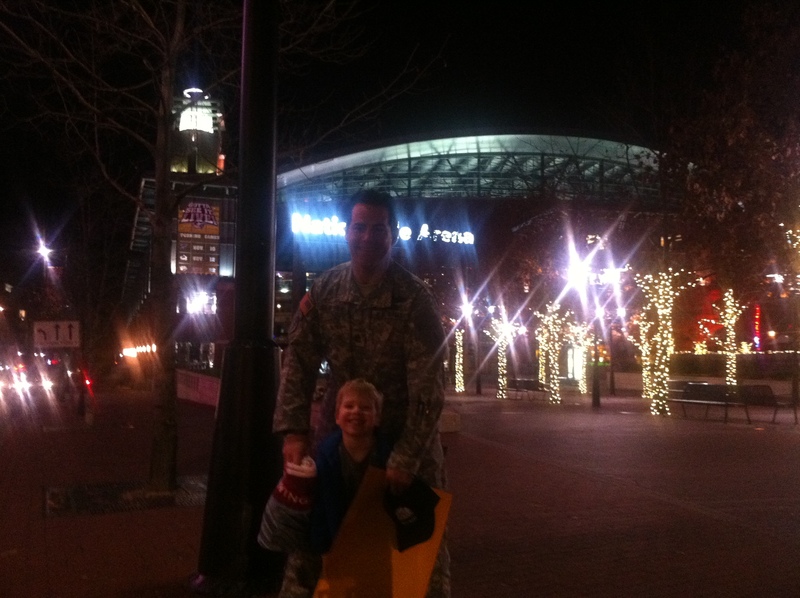 3 Responses to Military Dad and 4 year old son honored during Blue Jackets game. Fantastic. I can never come up with anything other than “Thanks for keeping us safe.” Anything else just seems trite when you’re talking to this kind of a hero. A big THANK YOU to all those serving our country.